The “front” of our cabin faces north(ish). I quote the word “front” because our use of “front” and “back” when describing the cabin is highly ambiguous. By the plans we used to build it, the front is where we have the screened-in porch and a set of steps leading down to the yard. And, the back is on the opposite side, of course. However, the driveway is at the back, along with the outbuildings and the door we use to go in/out about 90% of the time. So, that entrance is often called the front. And, the front is called the back. But, sometimes we call the back the front. So, it can be very confusing. Anyway, in the past we did not use the front steps to access the yard. It became impossible to use after the first snow or two because snow would avalanche off the metal roof and pile up on the stairs and landing at the top of the stairs. Since this side of the cabin faces north, we got very little melting, so the snow would continue to pile up all winter. Sometimes, one could even climb it up to the roof. 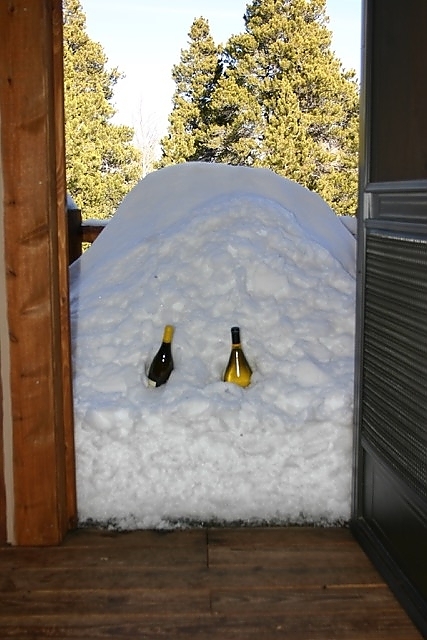 The snow pile on the landing was used more for storage of wine (we just pushed the bottles into the wall of snow), than access to the yard. Now that we have a fenced in yard area, it is really nice to be able to let the dogs out/in via the front door. So, we really needed fix the snow avalanche problem. Because several feet of heavy, wet snow would sit on the landing and steps for many months at a time, the railings and steps had begun to rot. They were actually dangerous to use. So, we had a contractor (actually, the guy who was the general contractor for the cabin build), replace the steps and railings. (The steps are done, but the railings are custom built and not yet installed as I write this.) 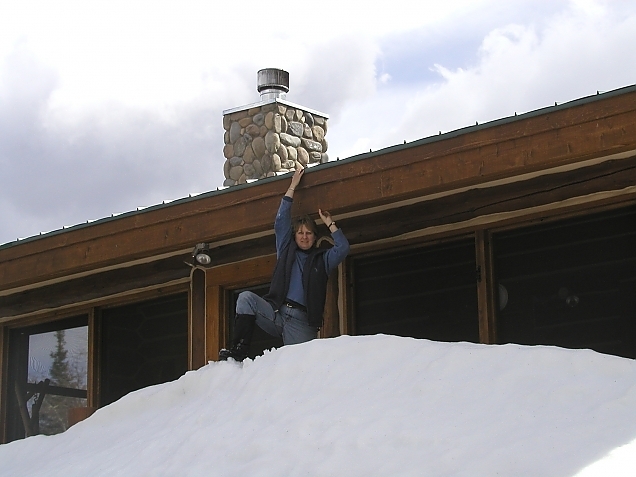 And, we had him put snow guards on the roof to keep the snow from avalanching. 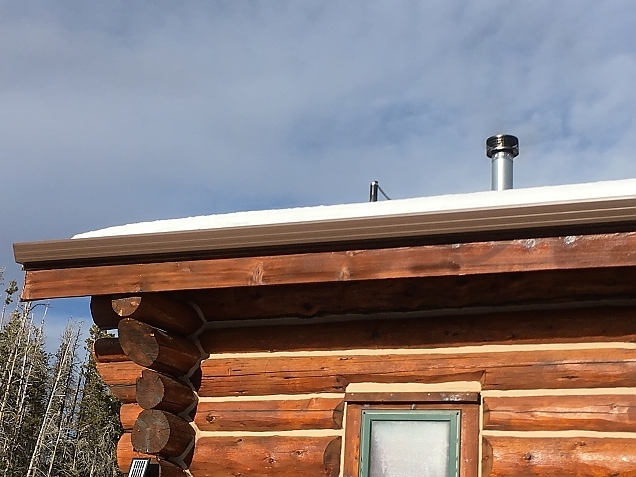 Snow guards are small attachments to a metal roof that stick up a couple of inches and hold the snow on the roof instead of allowing it to slide. 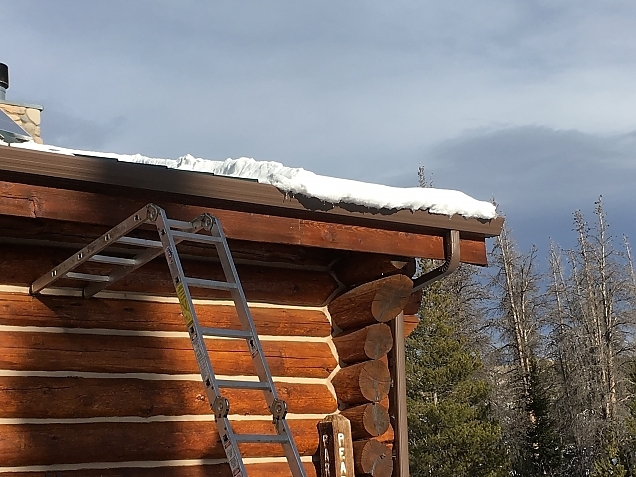 We also had him put some on the back of the cabin above the new deck to keep the snow there from also sliding down and covering the deck. So far, they seem to be working great. We did not put snow guards where the solar panels are since I want the snow to slide away from them. I actually have to get on a ladder and use a snow rake to pull the snow off the roof below the panels. Here, there are no snow guards. Note the snow overhanging the gutters. I climb the ladder to scrape snow off the roof and solar panels here. Here, there are snow guards on the roof. Notice how disciplined the snow is. We may not have really gotten any avalanching like previous years anyway. We had gutters installed on the front and back, and the gutters were acting a bit like a snow guard in that the snow did not tend to slide off in huge chunks. Instead the gutters held it back. But, it would cover the gutter and start to hang off over the eve, and then form icicles as well as drip into ice pools on the ground or the steps or the deck. Very dangerous. And, not good for the gutters. 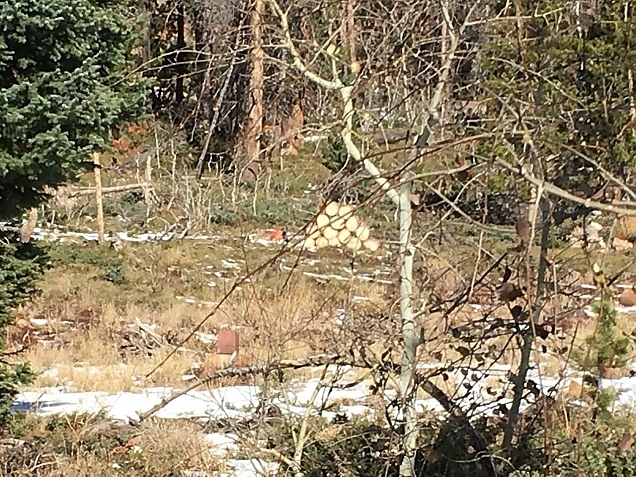 We had a couple of 100+ year-old beetle-killed pine trees close to the cabin that we cut down recently. I guess the correct term is "felled". 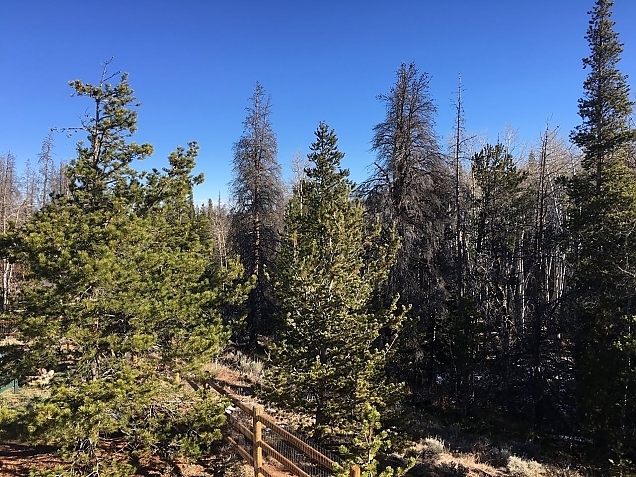 I don't think they'd have damaged the cabin or fence when the fell naturally, but they could easily have taken out dozens of still living trees and caused a lot of damage. The trees are just to the left and right of the center of this photo, taken from our front porch. Here is an "after" photo for comparison. We hired a lumber jack (of all trades) to cut the trees. My saw looked like a toy next to the saw required to bring these trees down. One now lays pointing north along the side of the ridge, the other pointing south. He felled them in exactly the positions we wanted to allow for game to still come up from the valley and to minimize collateral damage. 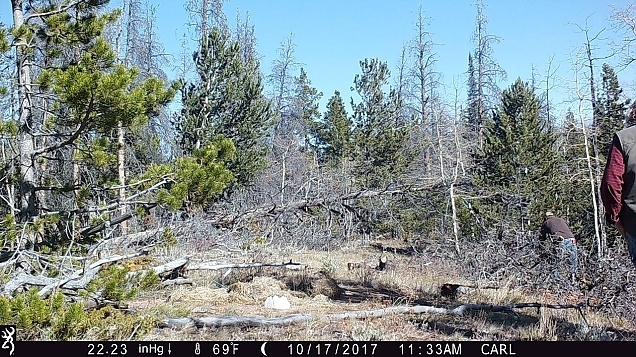 You can see videos of both trees below. Jay (the lumberjack) would cut a notch at the bottom of the tree to direct the tree to fall in a certain direction (although with old dead trees with some rotting, this can be a challenge), then a cut from the opposite side to create a hinge arond which the tree falls. It took a lot of skill to be as precise and he was. His son, James, would also push on the tree with a long pole to direct it. All this was done in pretty high winds that were not blowing in a helpful direction. We'll get some great firewood out of that tree! And, we may use some of it to create an entry sign at the driveway. Maybe. Someday. It is nice to have these trees down. The view from the porch is a bit nicer. 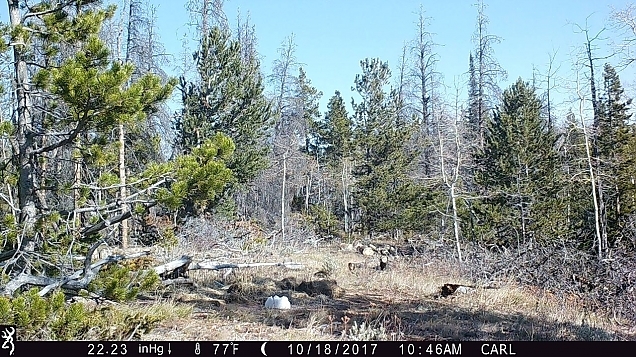 And, we also now have a better view of the bottom of the valley where moose and elk often hang out. The beetle-kill epidemic from several years ago has certain changed the whole ecosystem around the cabin. We are way behind in preparing for the winter. And, it seems winter has already come--several times. By this time last year we had about 5 cords of wood cut, split and stacked. This year, we are well behind that goal. 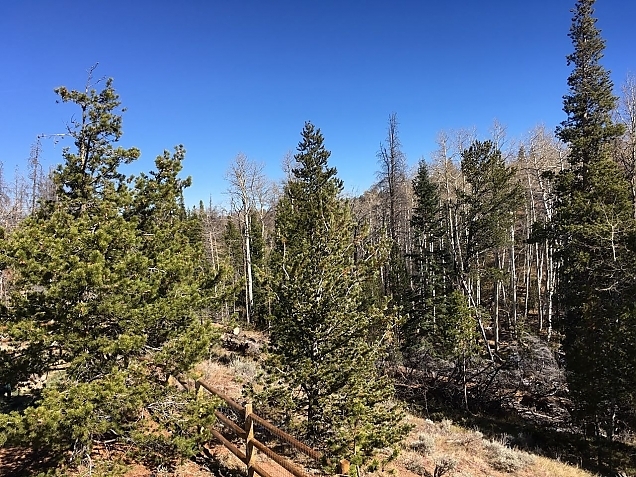 Another piece of good news is that after several early-season snow storms, we now have great weather predicted for the next couple of weeks. 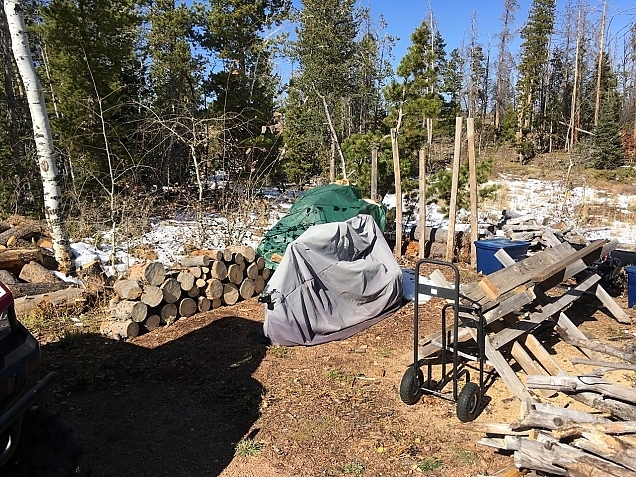 That will allow us to gather even more raw wood from around the land and get it hauled to the cabin site, where we can cut and split even in winter if needed. A stack of logs from cutting up a tree that had fallen in the meadow. What the heck did we do this year? It has passed so fast! Well, we did get the exterior of the cabin refurbished. We built a deck on the south side of the cabin. The dogs got a fenced in yard (which has been a huge hit). The barn got stained and painted. We did several dogs shows as well as a few weeks of "vacation". We've been busy. But, now we've got to buckle down and finish getting ready for winter. Who knows what lies ahead?